BS-813: This Battery Powered LED Light Pod is the perfect companion when you need a little light in a dark place! Great for motorcycle tour packs and saddlebags, Trunks, Tool Boxes, Campers, RVs, ATVs, UTVs, Marine, and much more! VX-46: The VX-46 Bagger Kit comes with a 40 inch power cord and a small flush mounted circular switch that controls both lights. Trunks, Bags, Saddles & More. The small 2.7″ diameter housing allows the Kit to fit in almost any compartment. Everything you need is including in the packaging, installation is quick and easy. It’s no secret that motorcycles don’t have the most electrical power available. The Bagger Kit only uses 0.33 Amps so your bike will barely notice it! 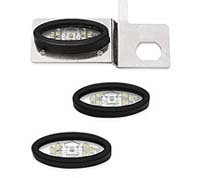 1626: Add additional light where it is needed most with the LED Pods. Now there is no need to fumble with flashlights or try to park under street lights to find your belongings. Lights run on 3 AAA batteries (included) & run up to 100 hours. Great for saddle bags & tour boxes! Just push lens to activate. 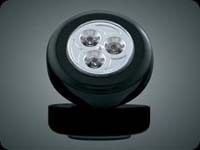 Roto-360: Universal LED Light - Black. Light rotates 360° and tilts 45°, Batteries included, LED lights last 100,000 hours, has magnetic base and velcro pad included for mounting, water and shock resistant. 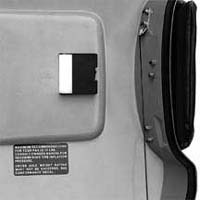 Install in tour-pak or saddlebags or glove boxes. CS-1: The multi-purpose LED Light Stick is a must have for every motorcyclist. As a Saddlebag/Tour Pak Light you attach it with a provided clip and existing screw, it rotates and re-positions with ease to your needs. As a LED Safety Flare you magnetically attach it to a provided disk and place it 10 feet behind your bike as a very bright safety beacon. 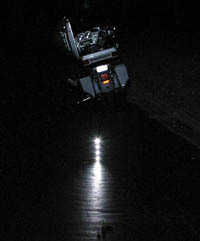 As a Flashlight you use it as an inspection light/flashlight to inspect your bike. TL-70: Powered by four AAA batteries, this compact utility light is great for inside saddlebags, Tour-Pak® components or anywhere else you need more light. Attached with hook and loop fasteners, the light is easy-to-install, and easy to take on and off for convenient use. It features a high-intensity bulb, a recessed switch to prevent accidental operation and a lens with a molded-in Bar & Shield logo. (Batteries not included.) Universal fitment. Approximate size: 3 1/4" x 3" x 3/4". 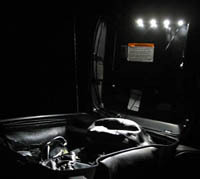 Tour-Pak® & Saddlebag Interior Light Kits: This bright convenience lamp kit turns night-time into day when you open your Tour-Pak® or saddlebag. 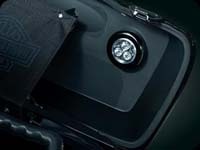 A brilliant white LED light pod mounts inside the Tour-Pak® to illuminate the interior, and the two available LED light pods mount to the bottom of the Tour-Pak® to cast light inside the open saddlebags. Each LED light pod features a soft-touch micro switch for ease of activation, and a 5 minute auto shut-off timer to prevent battery drain. Complete 3-Light Kit is available, or you can start with the 1-Light Tour-Pak® Light Kit and add the Saddlebag lamps at a later time. Kit includes quick-disconnect wiring harness and installation hardware. 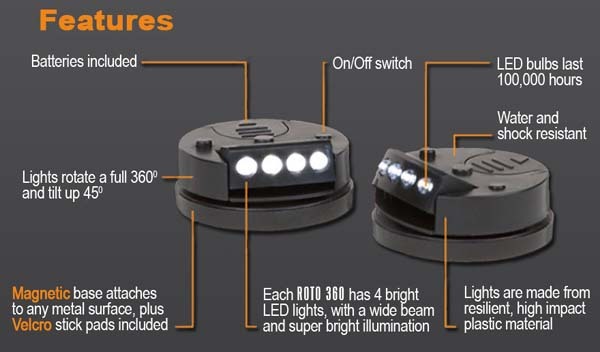 TL-32: 1-Light Tour-Pak® Light Kit. 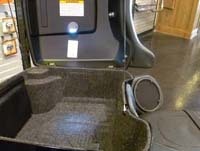 Fits '93 - '13 Touring models (except FLHTCUTG) equipped with rigid or detachable King or Chopped Tour-Pak® Luggage. 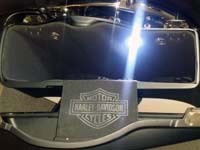 TL-31: 3-Light Tour-Pak® and Saddlebag Light Kit. 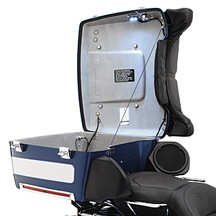 Fits '93 - '13 Touring models (except Trike) equipped with rigid or detachable King or Chopped Tour-Pak® luggage. TL-89: Fits '09 - '13 Trike models equipped with a King Tour-Pak®.